A Global Festival for Peace, Earth Awareness, and Community Celebration! This year, we will focus our intentions on “Celebrating the Forests” and how we can protect them for generations to come. EARTHDANCE Also FEATURES…A Synchronized Global Peace Prayer with over 350 locations in 60 countries! Saturday night at 7pm. EXPERIENCE…a POWERFUL day and night of live CONSCIOUS world MUSIC, DJs, performance artists, drumming, HEALING Arts Temple, PRAYERDANSE Rave, DREAM Temple, sound healing, KIRTAN, kids activity tent, Body Artists, synchronized prayer for peace, Elder’s Wisdom Circle, the Conscious Culture CAFE, Hookahs, art & crafts VENDORS and environmental non-profit organizations. 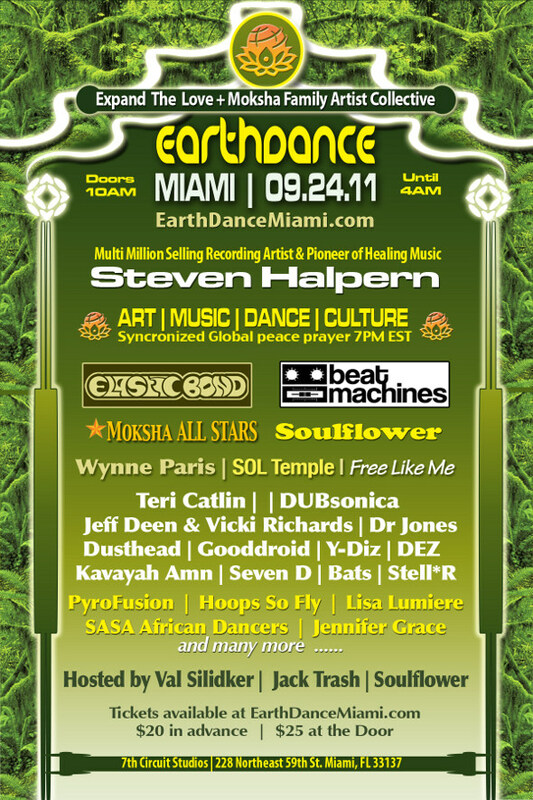 EARTHDANCE MIAMI also features spoken word artists, activists and POETS, qigong, and YOGA, visionary ART gallery and LOUNGE, as well as mind, body, spirit WORKSHOPS! *Expand the Love’s Dream Temple and more! $20 pre-sale, $25 at the door. Re-entry is ALLOWED until 9pm! After 9pm: no re-entry. Sunday, September 18th between 2-4pm. Tune In! Come EXPERIENCE a truly conscious, globally connected one-of-a-kind Festival!